Billionaire environmental activist Tom Steyer speaks during a news conference in Washington, Monday, Jan. 8, 2018. The town halls attempt to "make the patriotic case to Democrats, Independents and Republicans about the need for impeaching Trump," according to a Wednesday press release from the campaign. COLORADO POLITICS — Billionaire Tom Steyer wants to impeach President Donald Trump — and he’s bringing his case to Denver. 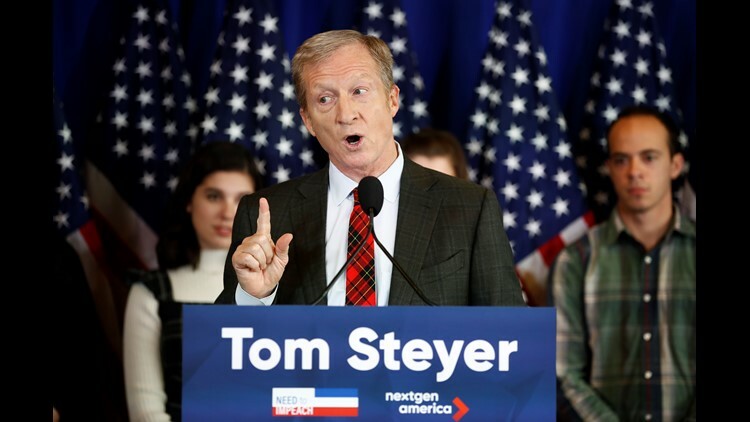 Steyer, a Californian who spent millions backing select Democrats in the 2016 elections, will host a town hall at Mile High Station May 16 — part of a series of similar events that his campaign, Need to Impeach, has hosted nationwide since March. The town halls attempt to “make the patriotic case to Democrats, Independents and Republicans about the need for impeaching Trump,” according to a Wednesday press release from the campaign. “According to a recent Quinnipiac poll, 70 percent of Democrats support impeaching Trump, yet two of the three Democratic members of Congress representing Colorado — Diana DeGette (Denver) and Ed Perlmutter (Lakewood)— voted against Representative Al Green’s impeachment resolution earlier this year,” the release states, adding that Polis voted in favor of the resolution. “With every day that goes by, Donald Trump erodes our democracy,” Steyer said in the release. “We need strong leaders in Congress who are not afraid to stand up to him and represent the will of the people who put them in office. Those who condemn Trump but do not back their words with action are enabling the damage he is inflicting on our country.